Poor Martin's Almanac: Hell Frozen Over? Ann has long been notorious for her attitudes toward children and parenting. Indeed, friends and family often joked that if Ann ever had a child of her own – God forbid – that she would probably eat it. Turns out they were only half right. The picture above is our first sonogram, taken in the 9th week of the pregnancy with junior measuring almost an inch in length. We've since been back to the doctor to clock junior's 13-week heartbeat at a speedy 160 beats per second. So far, both Ann and the baby are healthy and are proceeding well. Ann's even beginning to show a lil' bit. We currently have no plans to learn the baby's gender in utero. But we've got two great names already picked out and ready to go. We've even got some nicknames on deck. 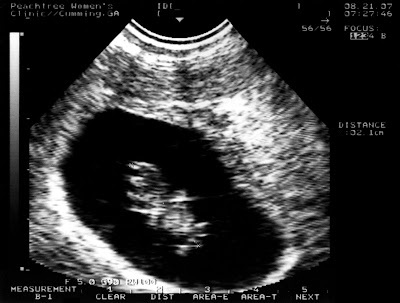 We'll be posting updates here at PoorMartin.com as we have them, including sonogram images. Thanks to everyone for being so supportive so far! We are so excited for you! Love the picture, too!!!!! Can't wait to see you in a couple weeks!! I didn't know you guys were expecting. Congratulations! That's very exciting.